This bathroom renovation was completed as part of a third floor home renovation project. The renovation converted the third floor into a master living space. 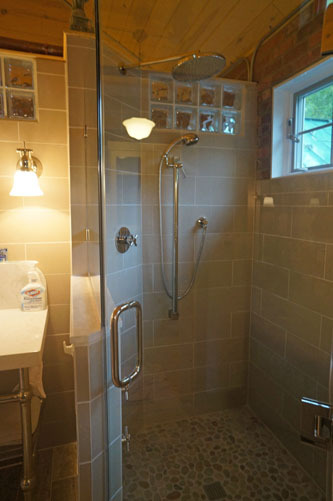 This bathroom renovation was completed as part of a third floor home renovation project. The renovation converted the third floor into a master living space, which included a 9ft. X 9ft bathroom. The wonderful features of this bathroom design include a heated shower floor and no ceiling, leaving the space open to the 14ft. cathedral ceiling height of the third floor space. The glass block and exposed pipes and bricks give the new bathroom a slight industrial look.